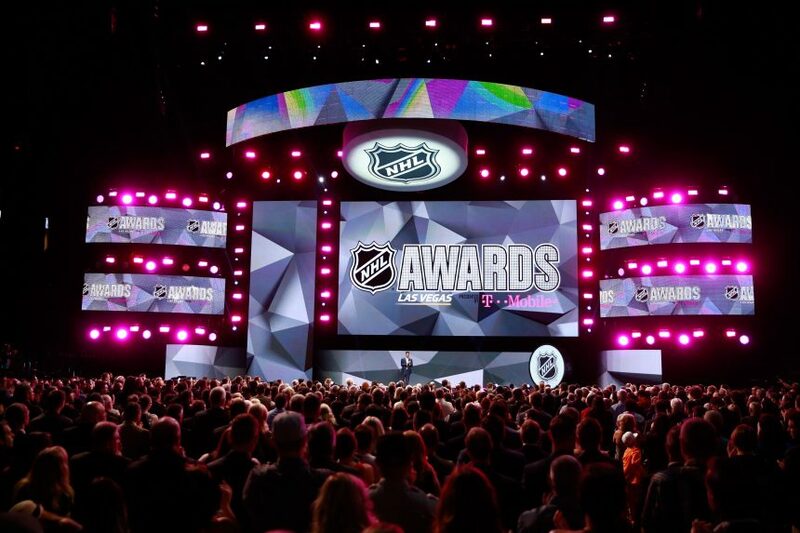 NHL Awards: Halfway Mark - The Point Data-driven hockey storytelling that gets right to the point. 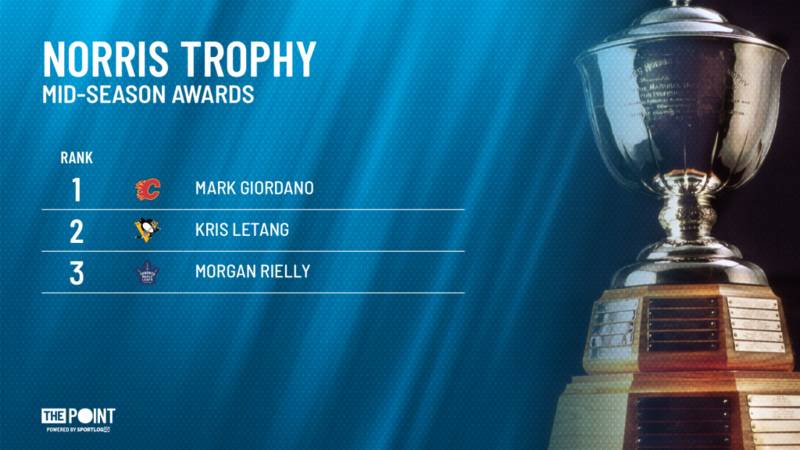 Halfway through the NHL season, it’s time for our mid-season awards. This list is based on accomplishments to date, not a forecast of who we think will win these awards at the end of the season. Enjoy! If it was a slam dunk when we did our quarter mark awards, it’s an uncontested two-handed jam on a four foot net at the halfway mark of the season. 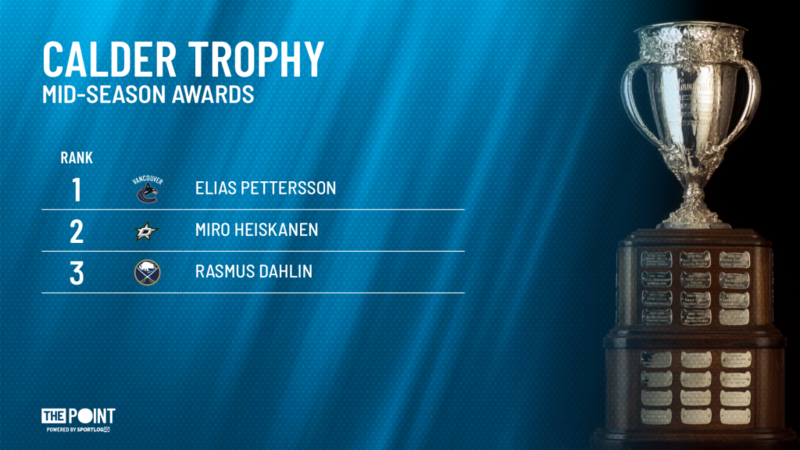 Elias Pettersson is the midway winner of the Calder trophy. Pettersson’s 22 goals are twice as name as any other rookie. His 42 points are 17 more than Colin White who ranks 2nd. We like to provide you with stats and insights you won’t find anywhere else, here at The Point but what’s the point with this guy. All you need to know is written above. Pettersson has an all-world release and is a better playmaker than he gets credit for. Let’s just hope he’s not out long after going down awkwardly last night in Montreal. Miro Heiskanen is our runner-up at the halfway point of the season. Heiskanen leads all rookies in ice-time by over two and a half minutes at 22:58 per game. His 19 points rank 5th among rookies and 2nd among rookie defensemen, 1 behind Rasmus Dahlin. If you’re wondering why Dahlin is ranked behind Heiskanen, he doesn’t play quite as much, the competition he faces isn’t as tough and Heiskanen has 9 goals to Dahlin’s 4. Both are terrific young defensemen and the order could change by the time we get to the end of the season but for now, it’s Miro then Rasmus. 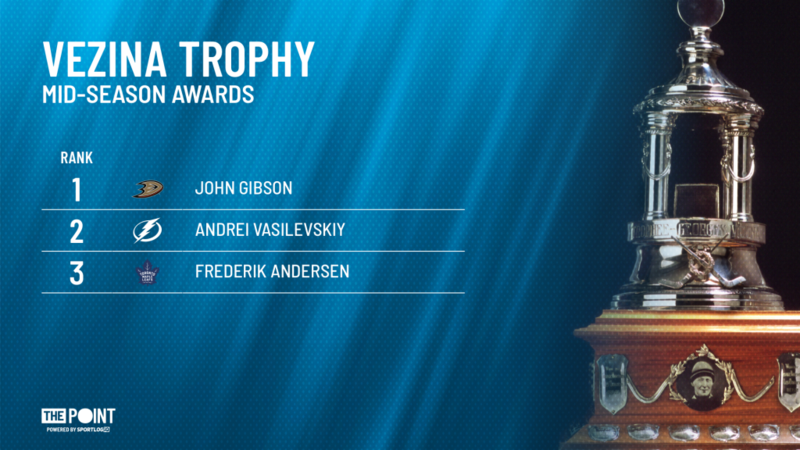 John Gibson gets our vote as the mid-season Vezina trophy favorite. Gibson ranks 2nd to Marc-Andre Fleury in games played and 5th in save percentage on a team that allows the 2nd most quality shots against of any team in the league. In addition to being deficient defensively, the Ducks are the 2nd lowest scoring team in the league and yet, they are in a playoff spot. John Gibson is the biggest reason why. 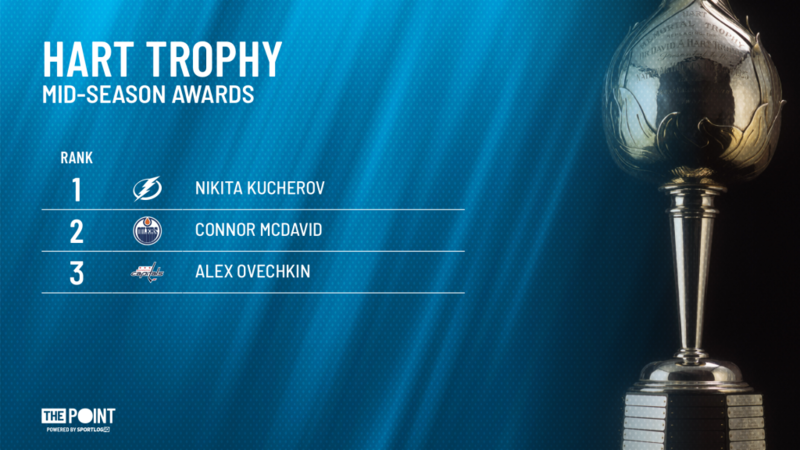 Andrei Vasilevskiy is our runner-up. Despite a common misconception that his numbers may be inflated by playing behind the top team in the league, Vasilevskiy actually faces more quality shots against than any goalie in the league, per game. We wrote about him and Gibson in detail recently, here. Despite missing a month with a broken foot, Vasilevskiy cracks our top-3 finalists due to the amount of quality shots he faces and the fact that he still ranks top-10 in save percentage. Add it all up, shot quantity and quality and he is saving his team nearly one goal per game, relative to league average, which ranks best among qualified goalies. Frederik Andersen is our second runner-up, playing 30 games and winning 20 of them. 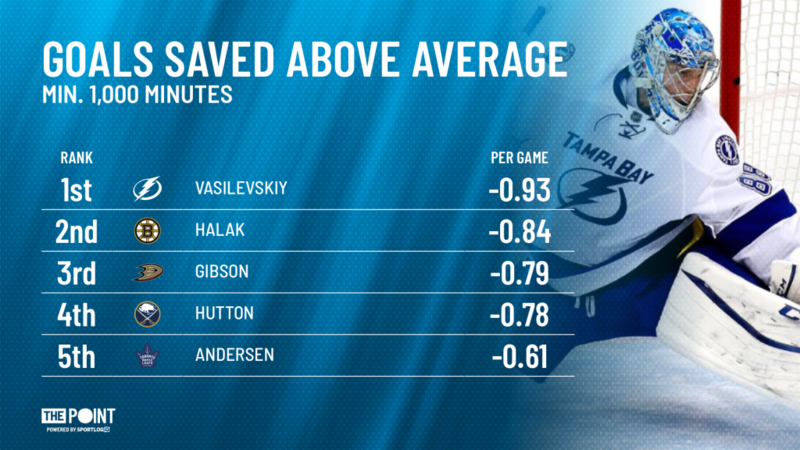 Andersen ranks 2nd in wins and 8th in save percentage and like Vasilevskiy, plays behind an offensively gifted team that gives up a good amount of chances against. Andersen saves his team an average 0.61 goals per game, based on shot quantity and quality, 6th among qualified goalies. To be honest, outside of Gibson, there’s a lot of goalies with great numbers who have played around 20 games – Vasilevskiy being the best of that bunch. There’s also a lot of goalies with 25+ games played with numbers that aren’t quite as good. It’s tough picking 2 through 10 and will be easier once we get to the three-quarter mark. Alex Barkov, Selke trophy. Like peanut butter and jam. The case for Barkov is simple. He impacts the game defensively at a higher rate than any forward in the league. He has the most active defensive stick of any forward in the league and has somehow only taken one penalty. Barkov leads all forwards with 115 stick checks, nobody else has more than 100. He also leads all forwards in blocked passes in the defensive zone with 119. He’s blocked 238 total, 6th best in the league. Imagine making 353 successful defensive plays with your stick and not taking one stick infraction penalty. That’s how good this guy is defensively. Yes, he’s minus 10 on a non-playoff team but if you think that outweighs his individual defensive impact on the game, we can only hope you don’t have a vote on this award. Mark Stone would be the first winger to win this award in 15 years, if he does. Barkov is our clear choice at this point but what Stone is doing in Ottawa is remarkable. On a poor Senators team that gives up chances and goals like they’re going out of style, Stone has a 5-on-5 goals percentage of almost 60%. A perennial leader in takeaways, Stone ranks 2nd in blocked passes among forwards. 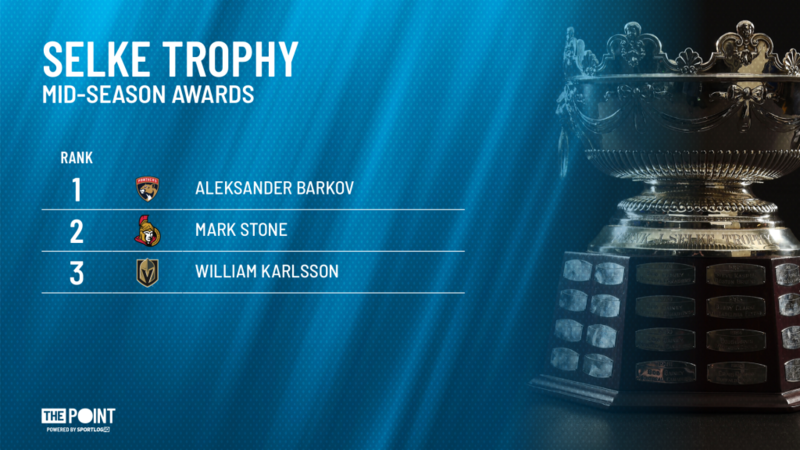 William Karlsson get our vote for 3rd place on this list. Karlsson ranks 4th in individual defensive impact among forwards and is a menace in the neutral zone, leading all forwards in stick checks. His awareness away from the puck also has him ranking 3rd in blocked passes with 248. Karlsson faces tough completion, rarely starts in the offensive zone has a positive high-danger shot differential at even-strength and kills penalties. Mark Giordano was our pick at the quarter-mark and he’s our mid-season pick for best defenseman, as well. The Flames captain does it all for Calgary playing big minutes against top competition in all situations. Giordano is tied for 3rd in scoring among defensemen and ranks top 15 in ice-time. He is north of 60% in high-danger shot differential at even-strength which ranks top-10 among defensemen. Kris Letang is having a whale of a year for the Penguins who are white hot. Letang is 6th in scoring among defensemen and is eating a ton of minutes, ranking top 5 in the league. The Penguins have one of the top powerplay’s in the league and Letang is a big reason why, racking up 16 points with the man-advantage, tied for 5th among all D-men. 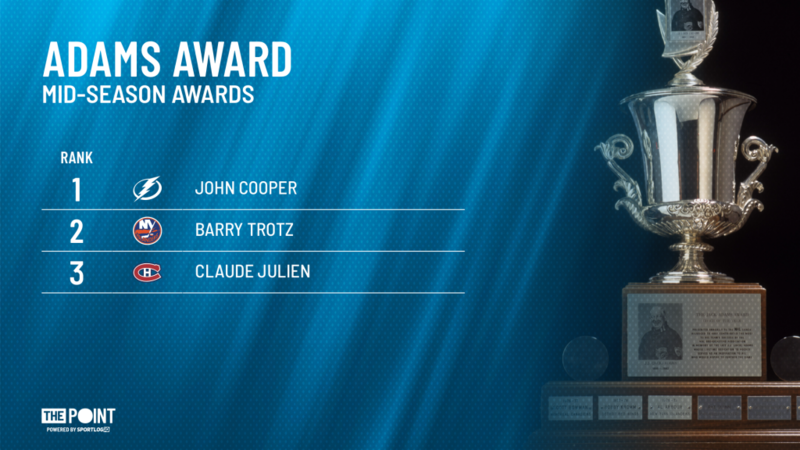 John Cooper gets our vote for coach of the year at this point of the season. The Lightning have 7 regulation losses in 41 games. Yes, we knew they would be good and they have a ton of star power but this team is on pace for 132 points. Even the most favourable forecasts wouldn’t have predicted that many points for this team. Tampa Bay has been so much better than everyone else, Cooper is our choice. Last season, the New York Islanders ranked last in goals against and 3rd last in the amount of quality shots they allowed. This season, they rank 2nd best in goals against average and 6th in quality shots against. Robin Lehner leads the NHL in goals against average and is 2nd in save percentage. So, what happened? Barry Trotz happened. The Isles are knocking on the door for a playoff spot in the East and Trotz deserves a ton of credit for the work he’s done this season. Claude Julien changed the way the Canadiens play and it’s paying dividends for the Habs. Less dump and chase / throw pucks at the net – more speed through the neutral zone and emphasis on creating quality looks. Special teams are a gongshow and that falls on the coaching staff, how much on the head coach is debatable but the fact is, the Montreal Canadiens are one of the top 5-on-5 teams in the league and Julien deserves credit for having this team in a playoff spot. Nikita Kucherov leads the league in points on the highest scoring and most successful team in the NHL. He’s a multi-faceted weapon on the powerplay with 9 goals (T-5th) and a league-leading 26 points. Kucherov plays a key role on the NHL’s most productive 5-man powerplay unit which is averaging 7.4 goals per 20 minutes of ice-time. Some context, the Maple Leafs top unit led the league in efficiency last season averaging 4.5 goals per 20. 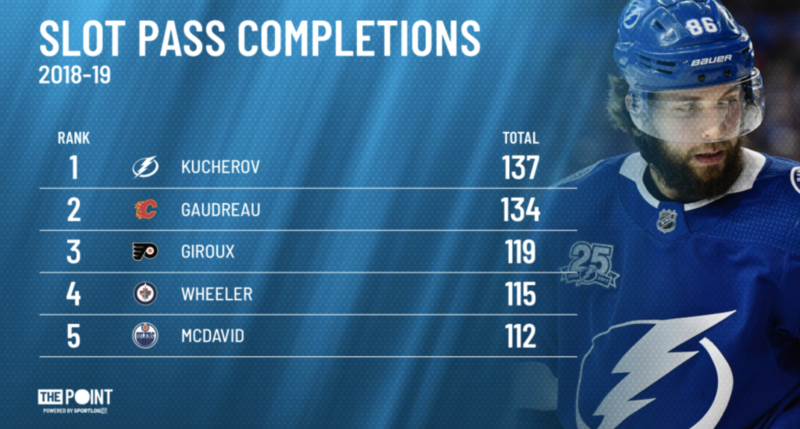 Kucherov is an incredibly gifted passer, leading the league in assists and pass completions to the highly-contested slot area. Connor McDavid is the best player in the world. We’re not debating that. He may well end up being first on our list by the end of the season but he’s not there yet. McDavid drives offense for his team like nobody else, putting up 61 points in 39 games. How impressive has he been? McDavid ranks top-5 in points, offensive zone puck possession, slot pass completions and controlled zone entries. He’s the only player in the league rank top-5 in these offensive key performance indicators. There’s no one else like him and we don’t buy the notion that you should be disqualified from contention if your team doesn’t make the playoffs. Who came up with this unwritten rule? The fact that McDavid has 61 points in 39 games on a team starving for talent on the wing makes his case even more impressive. This was a tough one. Johnny Gaudreau, Nathan MacKinnon, Mikko Rantanen, John Gibson. There are lots of great candidates who might bump themselves up into a top-3 spot by the time we do our three-quarter mark awards. But, we’re giving Alex Ovechkin the nod at the halfway point. Ovechkin scored his league-leading 30th goal of the season last night in just his 39th game. What earns Ovie MVP finalist status is the fact that his goal production is carrying the Capitals right now. No one else on the team has more than 12 goals. He has 30. What a legend.